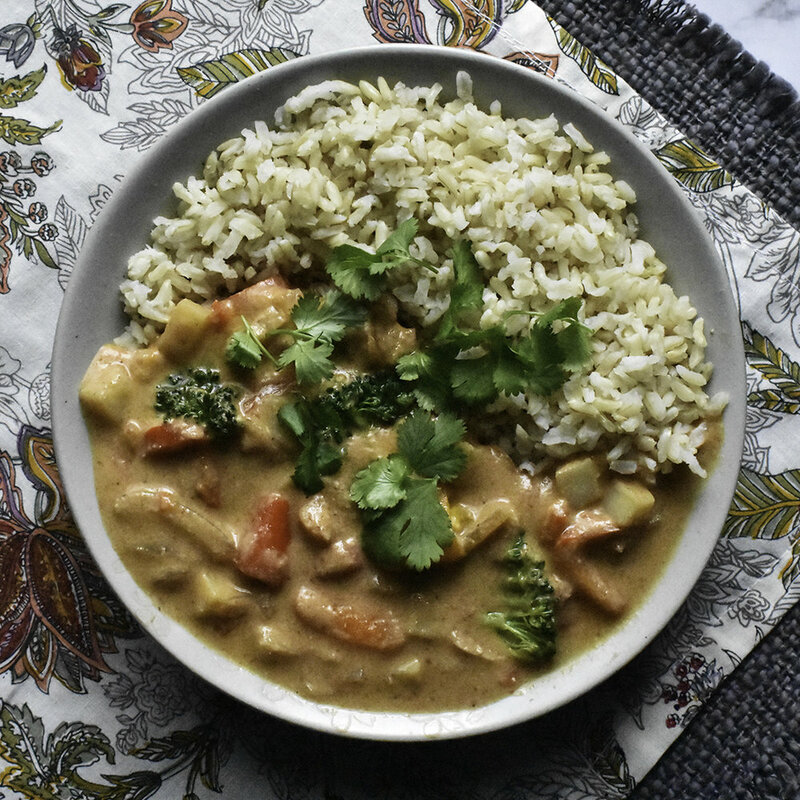 After pinning down Red and Green Thai Curry, I was still having trouble making a good Massaman curry, the scrumptious dish where vegetables swim in a sweet peanut sauce. We have a food cart in town that makes fabulous Massaman curry, so I had a very high standard to reach. Finally I succeeded. But then I had the great idea to eliminate the saturated fat of the coconut milk. Using some raw cashews and coconut extract, I succeeded. If you didn't tell someone about the substitution, they would not likely notice. From 462 calories and 14 grams of saturated fat to 365 calories and 2 grams of saturated fat per serving....that's 12 grams difference in saturated fat per serving--as much as in a Burger King Whopper. Drain and rinse the cashews (if you soaked them) and combine with the following ingredients in the blender. Blend until the cashews are dissolved. Set aside. In a Dutch oven or other large pan, water-saute the following ingredients in 1/4 cup water, until the vegetables start to get tender, about 5 minutes. Add the curry paste into the vegetables and stir with a wooden spoon or silicone spatula on low for 3-5 minutes so that the curry paste cooks a bit. Add a little water if it begins to burn. Stir in the following ingredients, bring the mixture to a boil, then reduce heat and simmer for 8 to 10 minutes, uncovered, until vegetables are tender but still have a little bit of firmness to them. Add a little more water if the sauce is too thick; cook a bit longer if the sauce is too thin. Taste and season with more soy sauce if desired and let stand for 5 minutes. Serve with hot rice and garnish with cilantro.